Tells the story of a super-smart little girl (Mara Wilson) who's woefully misunderstood by her parents (Danny DeVito, Rhea Perlman), her brother, and an evil school principal (Pam Ferris). With the help of her telekinetic powers, along with a brave best friend and a wonderful teacher (Embeth Davidtz), Matilda discovers she doesn't have to get mad to get even. CULVER CITY, CALIF. (Sept. 23, 2013) - See the world through a kid's-eye view when the modern fairytale Matilda debuts for the first time on Blu-ray(TM) with Digital HD UltraViolet(TM) Dec. 3 from Sony Pictures Home Entertainment. The digitally re-mastered Blu-ray comes with the all-new featurette "Afternoon Tea, A Very Magical Matilda Reunion," bringing the entire cast back together 17 years after the original filming of the movie. Shot exclusively for the Blu-ray, it captures the cast reliving the memories and magic of making the film during an afternoon tea party at director/star Danny DeVito's private Beverly Hills home. Based on the novel by Roald Dahl, Matilda tells the story of a super-smart little girl (Mara Wilson) who's woefully misunderstood by her parents (DeVito, Rhea Perlman), her brother, and an evil school principal (Pam Ferris). With the help of her telekinetic powers, along with a brave best friend and a wonderful teacher (Embeth Davidtz), Matilda discovers she doesn't have to get mad to get even. The Blu-ray also comes with four previously released featurettes exploring the film's stunts and special effects with DeVito, lessons in etiquette humorously demonstrated with scenes from the film, a special reading by the book author's daughter, and a peek behind the scenes through the eyes of a young star (Wilson). Matilda Wormwood (Wilson) is an extremely curious and intelligent little girl who is very different from her low-brow, mainstream parents (DeVito, Perlman), who quite cruelly ignore her. As she grows older, she begins to discover that she has telekinetic powers. Not until a teacher shows her kindness for the first time does she realize that she can use those powers to do something about her sufferings and help her friends as well. Villains from the awful Miss Trunchbull (Ferris), headmistress of her miserable school Crunchem Hall, to her parents and older brother begin to feel her ire. 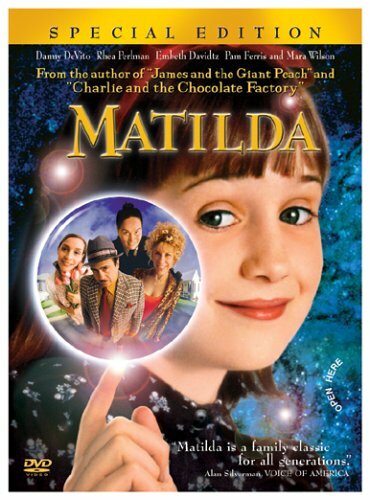 Based on the novel by Roald Dahl, Matilda was directed by DeVito from a screenplay by Nicholas Kazan and Robin Swicord. The film was executive produced by Michael Peyser and Martin Bregman, with Danny DeVito, Michael Shamberg Stacey Sher and Liccy Dahl serving as producers. * "Afternoon Tea, A Very Magical Matilda Reunion"
* "A Children's Guide to Good Manners"
* "Escape to the Library"
* "My Movie About Making Matilda by Mara Wilson"
Matilda has a running time of approximately 98 minutes and has been rated PG for elements of exaggerated meanness and ridicule, and for some mild language. About Sony Pictures Home Entertainment: Sony Pictures Home Entertainment is a Sony Pictures Entertainment (SPE) company. Sony Pictures Entertainment (SPE) is a subsidiary of Sony Corporation of America, a subsidiary of Tokyo-based Sony Corporation. SPE's global operations encompass motion picture production, acquisition and distribution; television production, acquisition and distribution; television networks; digital content creation and distribution; operation of studio facilities; and development of new entertainment products, services and technologies. For additional information, go to http://www.sonypictures.com/.